Ngone Seck studies for her Korean language class at her dorm room on Washington University's campus. When Ngone Seck graduated as Riverview Gardens’ valedictorian in May — the first in her family bound for college — it seemed nothing could slow her down. A few weeks later, the Italian immigrant with West African roots began her classes at Washington University on a full scholarship. But long-simmering and costly dental problems threaten the trajectory of the musically talented engineering major from Florissant. She lives with pain while working full time to pay for her dental care, and her grades are suffering. Seck’s dilemma illustrates the unique personal responsibilities facing many first-generation, low-income students. Sometimes, she’s afraid she won’t be able to outrun it. St. Louis Public Radio's Nancy Fowler follows Washington University student Ngone Seck as she navigates her courses, significant dental problems and full-time work. Ngone takes the MetroLink and multiple buses to get to work in St. Ann. Just before Seck’s family left Italy for St. Louis when she was 12, a dentist found a single cavity. It was never filled. As her family began their new life in the United States, her parents had no money for dental care, she said. Seck doesn’t qualify for government-funded dental care because she’s an Italian citizen. Years of inattention — no checkups, no cleanings — took their toll. Through middle and high school, the pain increased until she could only eat soft foods. Last spring, Seck finally found a dentist herself and paid for the visit. Almost every tooth was decayed. The dentist pulled two and sent her home with a handful of antibiotics and painkillers. Seck hasn’t kept a running total but figures she’s spent as much as $5,000 on dental treatments including extractions and a root canal. To foot the bill, she ramped up her hours this past fall at her job at Panda Express in St. Ann, sometimes working 60 hours a week while taking a full load of four courses, including calculus and Korean. Seck still needs two root canals, two implants and more than a dozen fillings — which could cost as much as $13,000 more. “What I always do is, I save up as much as I can, and whenever I have it, then I get the procedure done — just to avoid accumulating any debt,” she said. 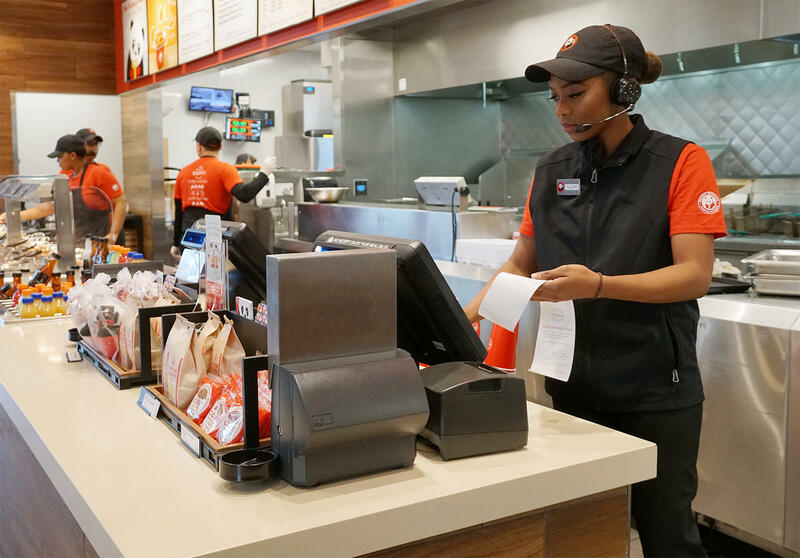 Ngone sometimes works as many as 60 hours a week at Panda Express. Seck’s path from a modest upbringing to an elite institution of learning reads like an American success story. As the top student at Riverview Gardens, she played three instruments including the flute and formed a study club for the ACT college-admissions test while also winning the title of prom queen. 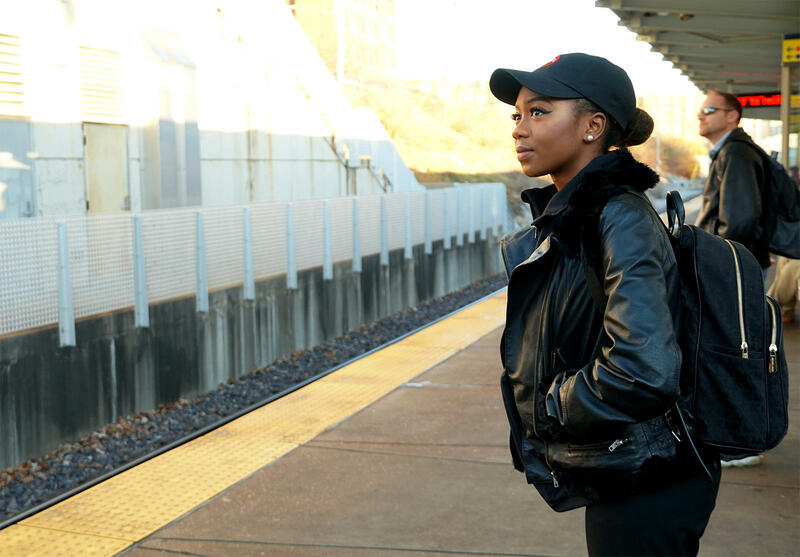 Even before enrolling in college, Seck already spoke three languages: Italian, the native Wolof of her Senegalese parents, and English, and had begun teaching herself Korean through YouTube videos. Near the start of fall semester at Wash U, she said things were going well. But as the semester progressed, she began missing classes and falling behind in assignments. She spends up to three hours a day riding several buses and the MetroLink to and from her job in St. Ann. When Seck received her final grades, she was disappointed. She declined to be specific but said her scholarship isn’t at risk as long as she maintains a 2.0 average, which she said she easily exceeds. The stress she faces worries Sierra Cody, Seck’s best friend since middle school. But Cody says her determined friend is rarely discouraged. Seck is afraid to slow down too much, because the longer she puts off the dental work, the worse it will get. Ngone walks off the stage with her valedictorian trophy at the end of her high school graduation ceremony. At Wash U, Seck is part of a growing population of low-income students. In 2014, just six percent of Wash U students were eligible for a Pell Grant, the number colleges use to measure efforts to achieve socioeconomic diversity. In 2015, the school set a goal of increasing that to 13 percent, or about 1,800 of its 14,300 students. The 2016-2017 freshman class was at that mark. Other elite institutions also are working to enroll a more socioeconomically diverse student body, according to Anthony Jack, an assistant professor in the Harvard graduate school of education. But admitting such students is only the first step, according to Jack, whose dissertation focused on the experiences of low-income students at elite schools. That work includes understanding that students like Seck often shoulder great personal responsibilities, Jack said. A decade ago, he entered Amherst College as a first-generation scholarship student from a low-income black family living in Miami. “There were just things I had to grapple with that my middle-class and upper-class peers did not have to worry about,” Jack said. With her own earnings, Seck pays several thousand dollars a year for Wash U dental and medical insurance, and books. She sometimes helps out with expenses for her family, which includes three little sisters, her mother, who braids hair, and her father, who drives for the ride-share companies Uber and Lyft. For most Wash U students, money flows the other way: toward them from their families. The median family income is $272,000, the wealthiest student body in the United States, according to a study from The Equality of Opportunity Project. But Seck sees her obligations as a personal matter and hesitates to ask Wash U for more help. 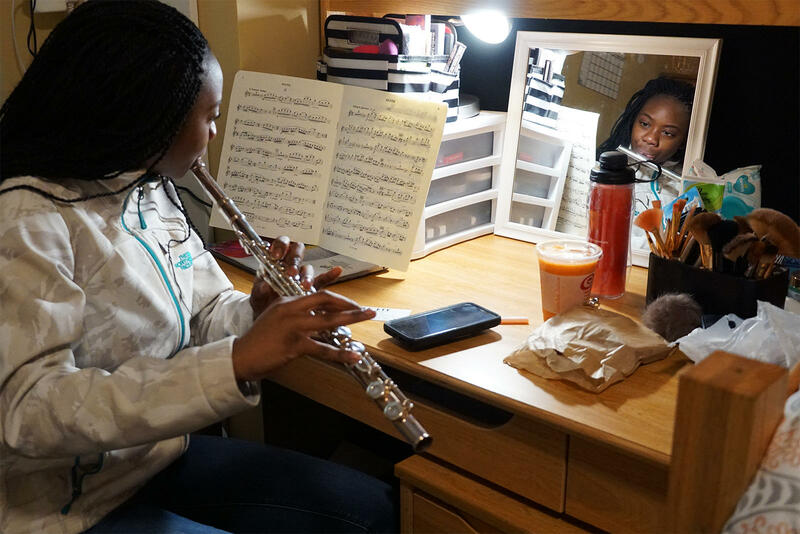 Ngone practices the flute inside her dorm room. Toward the end of fall semester, Seck did confide in an advisor who connected her with a campus group called WashU Cares which helps at-risk students. But then Seck learned that because she’s not a U.S. citizen, she needed to contact the International Student Association. 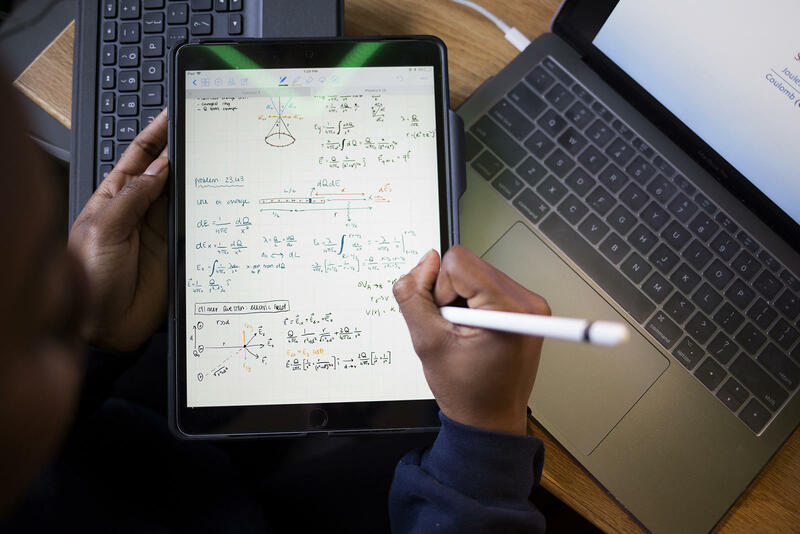 Wash U is working to streamline the system, according to assistant provost Anthony Tillman, who said many if not all first-generation, low-income students have expenses beyond tuition, room, board and fees that can interfere with their education. In 2016, Tillman oversaw the launch of the Office for Student Success, currently serving 358 students. The program provides academic support, professional development and a path toward financial resources. The university has some funds available for students with medical issues, and an application process for that money, Tillman said. But it’s up to the students to alert the school, especially when the need isn’t apparent. Helping socioeconomically disadvantaged students is an evolving process, according to Harvey Fields, Washington University’s dean for student success, who was a first-generation college student. Ngone Seck works on homework assignments in her dorm room. Institutions across the country are trying to address these students’ needs. Last week, the University of Missouri-St. Louis announced a new program matching first-generation students who are freshmen with faculty who were once first-generation college students themselves. The program, funded by a donor, will start out small by choosing one student per class with the hope of expanding it to include all such students at this public institution whose student body is made up of many more lower-income entrants than Wash U.
Seck also has a goal of helping others like herself. If she were to be relieved of her current financial responsibilities, she said she would use her time to create a team of Wash U students to mentor high schoolers like those in her own struggling Riverview Gardens district. “I want to create something that will give attention to students who deserve it so much and are so full of potential,” Seck said. This semester, Seck does have a little more spare time. She made a hard decision to cut her work week back to 30 hours, to help her focus more on classwork and maybe give her a chance to live more like a typical college student, hanging out with friends and going to movies. Giving up is not an option, Seck said. Just a few years ago, Ngone Seck arrived in Florissant from Italy and began the seventh grade. From the start, she was behind her peers. She struggled to adapt to her new country, had trouble learning English, and, at first, did poorly in school. Today, the Italian immigrant of West African heritage began her first day of college, on a full scholarship. Her journey is paved with the sacrifices of her working-class family, the comfort of her music and the support of good teachers. Washington University is a top-tier college, attracting both the nation’s smartest and richest students. That often puts the private university on the wrong end of rankings for socioeconomic diversity. To reverse that distinction, Wash U is halfway through an effort to have at least 13 percent of its students be from low-income backgrounds or be the first in their family to attend college. But proponents of college access say the goal isn’t ambitious enough — and won’t help foster a different atmosphere on campus. Kendric Carlock graduated from St. Louis Public Schools in 2014 with a 2.0 GPA. His parents never went to college. His family didn’t have a lot of money. His odds of attending college were, by all measures, not great. But the magnet-school grad was determined. With the help of his guidance counselor, Carlock found a space at Missouri Southern State University in Joplin. In the fall, he’ll be a senior in the communications department. Music is vitally important to Riverview Gardens High School band director Harvey Lockhart. But his students' well-being ranks even higher. During the past five years, Lockhart has made musicians out of dozens of students, changing the way they see themselves and their futures. For his efforts, The Arts and Education Council of Greater St. Louis will honor Lockhart Monday night as art educator of the year, in a ceremony at the Chase Park Plaza.